They say breakfast is the most important meal of the day. 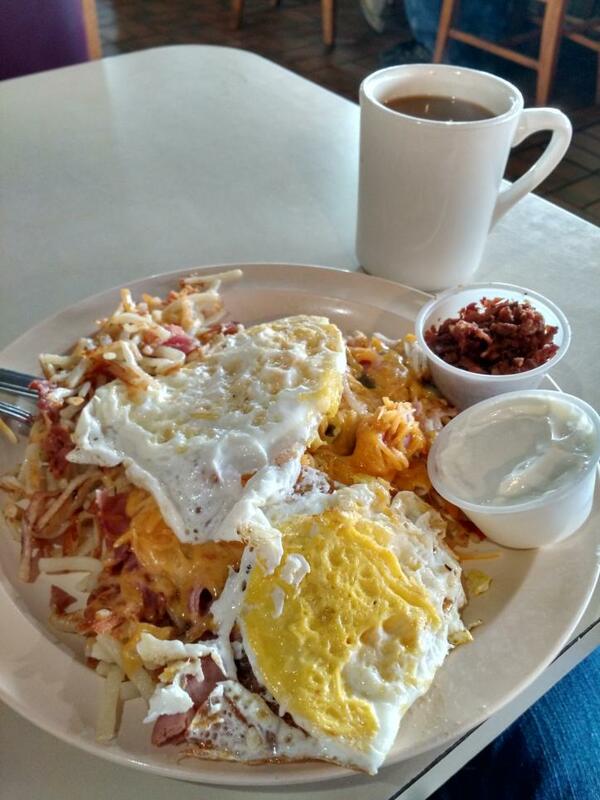 You’ll have no problem getting your morning off to a great start at these Southwest Louisiana diners and restaurants known for serving daybreak deliciousness. KD’s is locally renowned for great food, 24/7 hours of operation, and serving breakfast around the clock. One of their most popular “breakfast” items isn’t even on the breakfast menu! The “Rafferty” tempts hungry diners with fully loaded hash browns made with sliced ham, turkey, and roast beef, bacon, cheese, sour cream, and jalapenos, all topped with two eggs any way you like them. Unless you’re ravenous, the meal is large enough for two. Another popular dish is their Southern Chicken, served over hash browns with cheese, bacon, sour cream, and biscuits, and smothered in white gravy. Cotten’s Downtown also serves breakfast all day. You can sit at the counter and watch Mr. Al grill the orders efficiently. Because Cotten’s is best known for their hamburgers, the Old Fashioned Hamburger Omelet is a popular choice in the mornings. Other fan favorites include the cinnamon roll waffle and the Mt. Hashbrown, a mountain of hashbrowns piled with bacon, sausage, jalapenos, onion, cheese, white gravy & a fried egg. 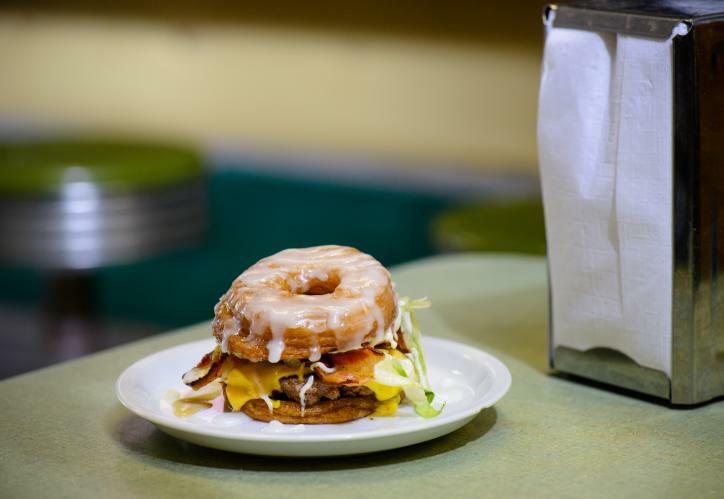 For those who want a hearty breakfast but insist on starting the day with a sugar rush, there’s the popular donut burger. But what really draws in the customers on any given morning are these thick fluffy pancakes. They call this a “short stack.” Uh huh. Southern Spice Restaurant has been dishing up breakfast to visitors and loyal patrons for nearly 20 years. 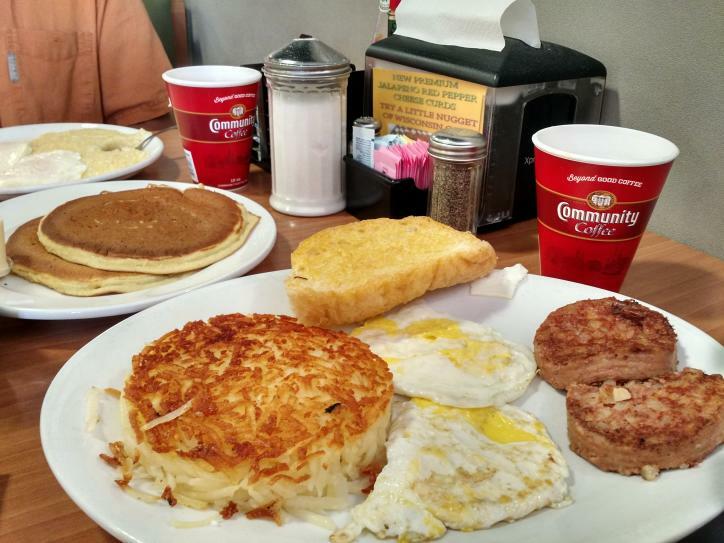 They serve the usual breakfast fare – eggs most any way, breakfast meats, grits, hash browns, pancakes, and waffles. According to Danita LeLeux, who owns the establishment with her husband Myron, the #1 Special, with two eggs, two bacon strips or sausage patties, home fries, hash browns, or grits, and toast or a biscuit, is one of the most popular orders. Personally, I’m not a big eater, so I prefer the #6 Special, which is identical to the #1, but half the amount of food. I order it with a biscuit. I don’t even like biscuits, but their biscuits are that good -- fresh, fluffy, and hot out of the oven. Pitt Grill has been satisfying customers in Southwest Louisiana for decades. They offer standard breakfast favorites as well as some unique menu items like New Orleans Style Cajun Pan Toast (Cajun bread sprinkled with powdered sugar served with syrup), Eggs in a Hole, the Breakfast Pile (hash browns, sausage patty, swiss cheese, and two eggs on top.) If you’re really hungry, try the Southern Breakfast, which has “a little bit of everything.” They offer Eggs Benedict on the weekends. 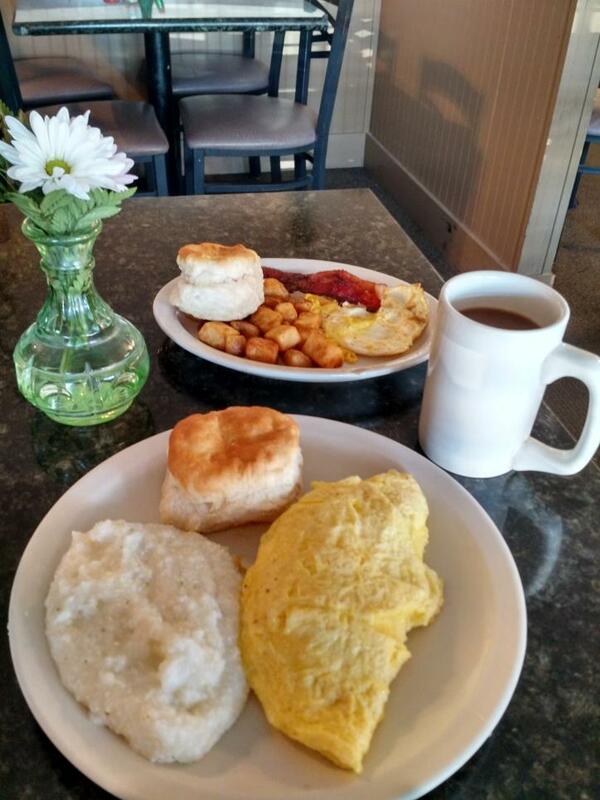 Breakfast is served all day, with extra large portions and reasonable prices, at four locations, including 606 W. Prien Lake Rd. in Lake Charles; 102 Benoit Lane in Sulphur, 1119 Lowegrout in Iowa, and their sister restaurant, PG’s Diner, 3048 Gertsner Memorial Dr. in Lake Charles. 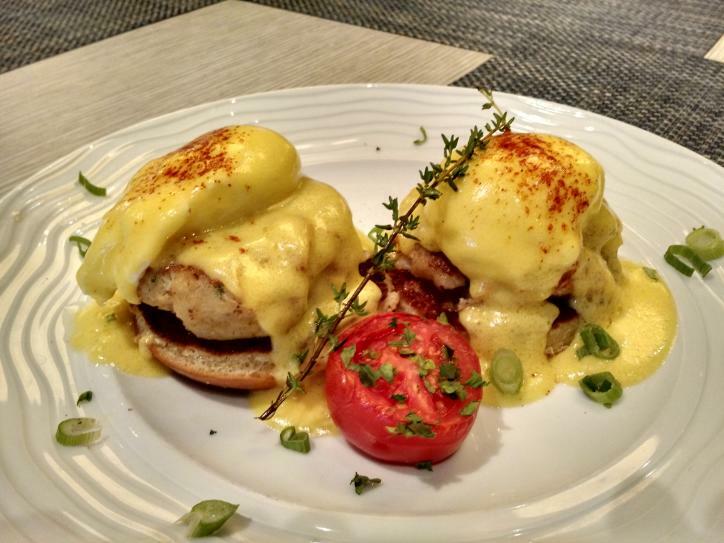 If you’re visiting the area casinos, you need not go far to find fabulous breakfast fare. 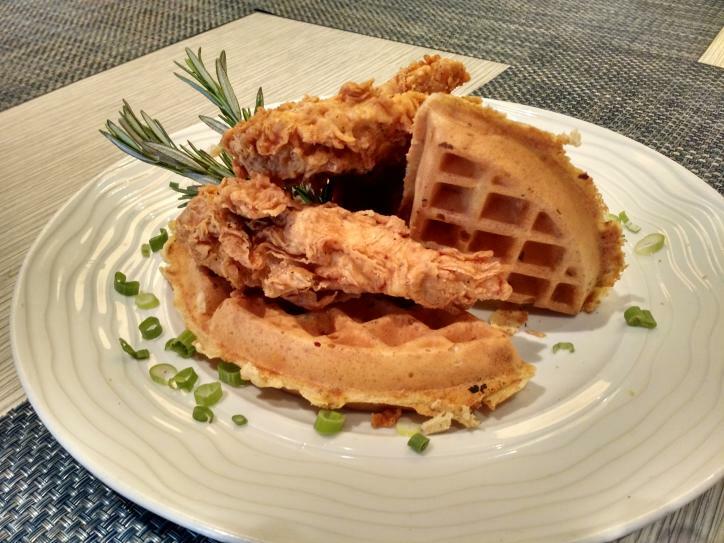 At Favorites Southern Kitchen, breakfast is so popular, patrons demanded this comfort food be served around the clock and L’Auberge management complied. Chef Kevin Thompson develops the diverse menu, influenced by his Creole roots. His kitchen uses authentic local seafood like crab and shrimp. Jams are made in-house. Specialties include Southern Chicken and Waffles (fried chicken tenders with rosemary-infused waffles and herbed butter served with white gravy and/or maple syrup), Crab Cake Benedict, Buttermilk Pancakes Foster (a tower of pancakes topped with pecans, bananas, and rum sauce), Crawfish Frittata, and fresh made Beignets with raspberry and chocolate sauce and so much more. At Golden Nugget Lake Charles, you can find breakfast at the Buffet or Claim Jumper, but for a most memorable morning or early afternoon dining experience, the Country Club Sunday Brunch steals the show with marvelous gourmet menu items, attention-to-detail presentation, and the best view in town. Enjoy a complimentary pastry basket and fruit cup to whet your appetite, washed down with a Country Club Mimosa or Bloody Mary. 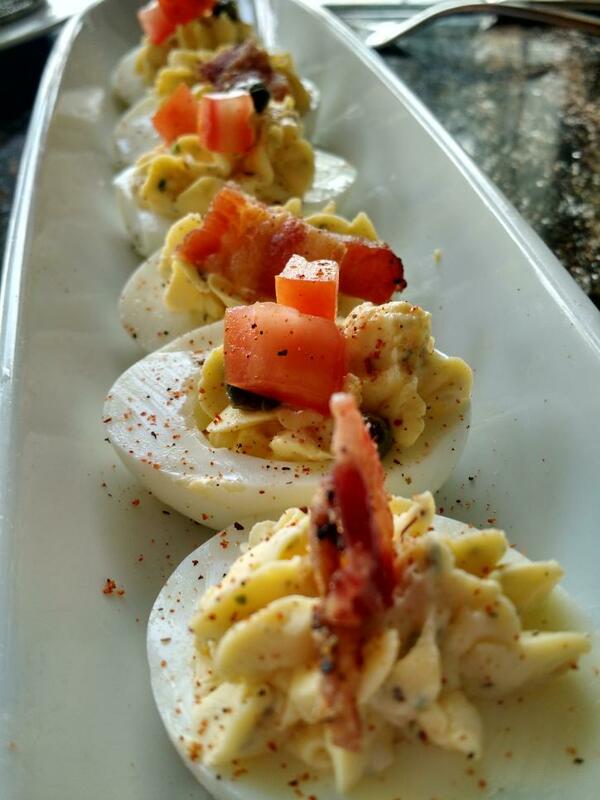 Deviled Eggs, delicious and almost too pretty to eat, are a light start to your meal. Ask your server about brunch specials. Chef Scott Holmes seasons his Chicken and Waffles with a drizzle of honey and a dash of chili spice. 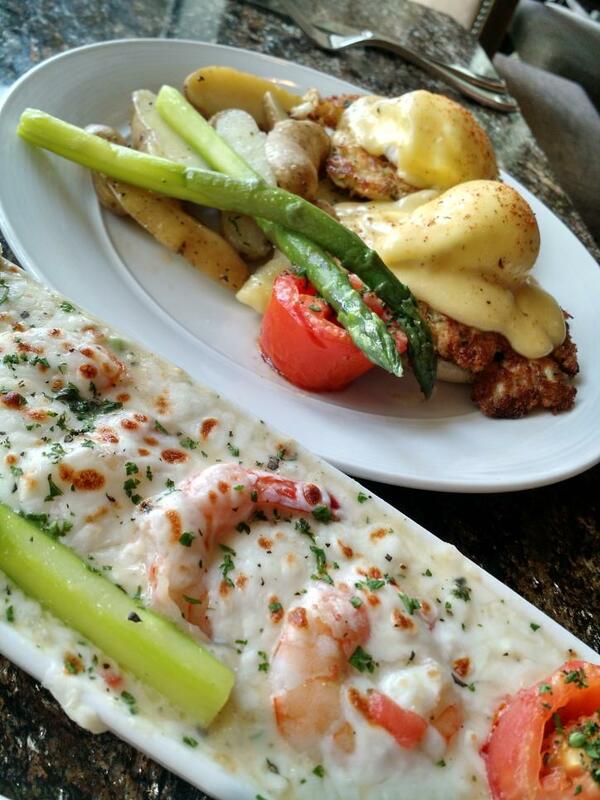 Crab Cake Benedict is served with herbed potato wedges and asparagus. From the menu, we couldn’t resist their popular Shrimp “Depeto” Casserole, made with shrimp scampi nestled in a lemon risotto mozzarella cheese custard. It’s rich and filling! Whether you’re in the mood for down-home cooking or decadent gourmet treats, Southwest Louisiana has a breakfast for you!